You may or may not have noticed that I have somewhat dropped the ball on my recap/rewatch of the first season/series of Doctor Who. Not only have I been incredibly busy the last month or so, but I was also kind of dreading watching this episode. I quit watching and I had to try a few more times to get through this episode. One thing that has struck me when I started watching this episode is that I can’t really remember the last time we had a decent historical episode of Doctor Who. In the many River Song episodes she mentions The Doctor taking her to different places and times on her many excursions out of prison, but we don’t have a lot of episodes where our team just travels somewhere in the past for no good reason. The last episode I can remember where they went off on a happy excursion to the past was the Donna/Tennant episode where they visited Pompeii. Most of the Moffat-era excursions to the past had to do with whatever wibbly-wobbly, timey-whimey puzzle agenda he wanted to deal with at any particular point in time. One thing I feel is kind of missing with more recent seasons of Who is this feeling of adventure, of just going to places because they are there. Every episode deals with some kind of universe-threatening crisis that must be solved and it gets kind of tiring after a while. I know in the last season with the Ponds they talk about going on adventures, but we never see them. We always have the reaction shot of wonder from each new Companion when they realize the TARDIS is bigger on the inside, why did they have to do away with the sense of wonder that comes with having a machine that will take you anywhere in time and space? I feel like this season afforded the writers one and only one opportunity to tell certain kinds of stories because they could only be told for the first time once. That was one reason I was so impressed that they chose to show the end of the world in the second episode. What impossible story do you tell when you can only tell the first impossible story once? What has significance and meaning? The destruction of the Earth and the realization that everything ends is rather interesting for the second episode of a new show. Wait, I am off on a tangent about other episodes of this show, not the one I am watching. Sigh. Excelsior. Supposedly, I heard that eventually the series would address the fact that Capaldi has previously appeared on the show in some form or fashion. They may have already but I don’t know about it because I am still behind on the series. It’s interesting to me to see how they deal with these continuity issues. I believe when Martha Jones was brought on as a companion she mentions having a cousin who died at Canary Wharf as a way to bridge the continuity issue of Freema Agyeman having appeared literally two episodes earlier as a different character. Eve Myles is the first of three eventual Torchwood cross plants from the main universe. Her character here is named Gwyneth. 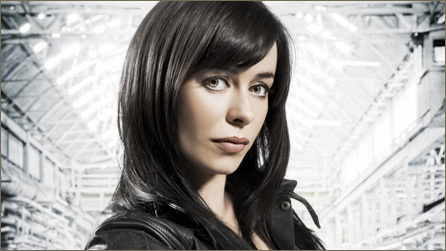 In Torchwood, her name is Gwen Cooper. It isn’t a big stretch to believe that the Torchwood version of Myles was intended to have been a descendant of this character that she plays. I’ll address the other continuity characters when we encounter them. Also realized that the weird alien fault line that Torchwood is built over is introduced in this episode. It’s interesting how many seeds for Torchwood are planted in this episode. It’s possible the writers just simply took a lot of stray pieces and repurposed them, but it’s fun to go back and see the trail of breadcrumbs that lead to Torchwood. I went into this episode feeling like it was something of a filler episode, but I am now realizing just how many things that became part of the Who mythos were introduced here. 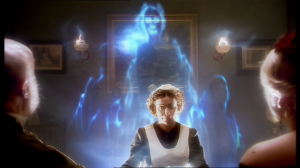 I don’t think Who should cannibalize itself by only doing Weeping Angels episodes, but it would be nice to see more of the world building they did in the first few seasons where you get a character like Cassandra O’Brian coming back. We can’t talk about this episode without mentioning our celebrity guest, Charles Dickens. Dickens is played by Simon Callow, who will forever be to me the theater owner from Amadeus who commissioned Mozart to write “The Magic Flute.” Interestingly, he also plays one of the idiotic theater owners in the miserable atrocity that was the film adaptation of “Phantom of the Opera.” The other theater owner was played either by Julius Caesar from “Rome” or Mance Rayder from “Game of Thrones”, depending on how old your pop culture references are. Yes, I watch entirely too much British media. Callow interests me because I have seen him in a number of different things. He is well known for being the funeral in “Four Weddings and a Funeral.” He also published an incredibly comprehensive three-part biography of Orson Welles. He is a fairly well known British prestige actor who either plays characters from Dicken’s oeuvre or Dickens himself. He is just well known enough that everyone has probably seen him in something, but not so well known that you can think of him as being that one guy who did this one thing. It’s good that Doctor Who got decent actors to play historical figures in the show. More recently, when it became a huge success, I can’t imagine it was hard to get well known character actors to appear, but I believe getting someone of Callow’s stature to appear in the first three episodes was something of a coup for the show. 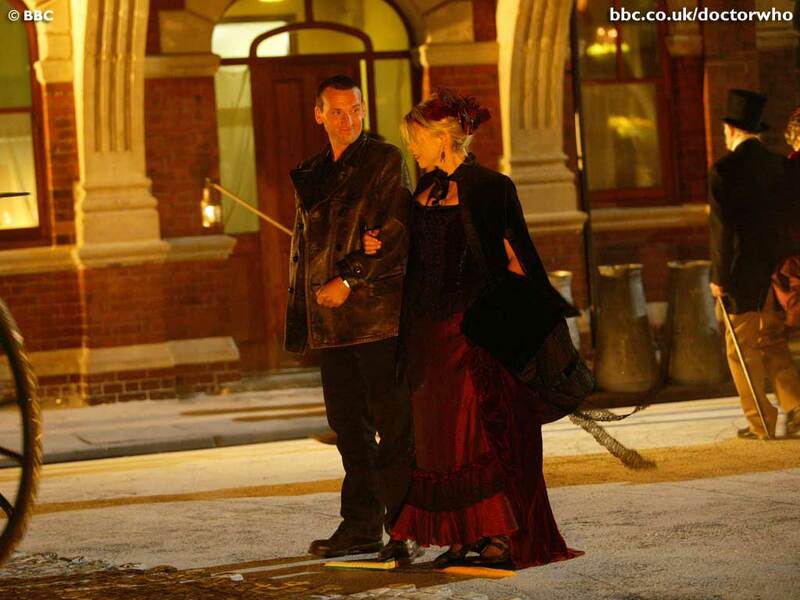 Another thing I just noticed with this episode is that The Doctor makes Rose change into period-appropriate clothing before turning her loose on the town. Again, this is another thing that the show has kind of crept away from in most circumstances. Usually when the companions travel back in time, they get to wear whatever it is that they normally wear regardless of the time period. I noticed that Rose has been wearing the same outfit for the last three episodes. I like the authenticity of the costume designer acknowledging that Rose never went home to change her clothes because she impulsively jumped in the TARDIS with The Doctor, plus the fact that most people wear things more than one time. That lends a bit of continuity to the episode. However, it probably has more to do with budget reasons and laziness than actually putting thought into the continuity. 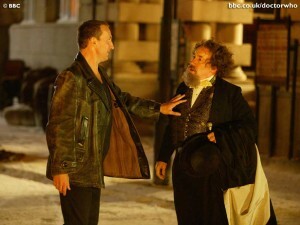 It’s also a nice lampshade on the show for The Doctor to claim he has changed because he changed his shirt. The Doctor always wears clothes on the same theme even if certain aspects of the outfit like the color of the suit will change. There is a wonderful scene in this episode where Rose and Gwyneth talk about their jobs and how they hated school. 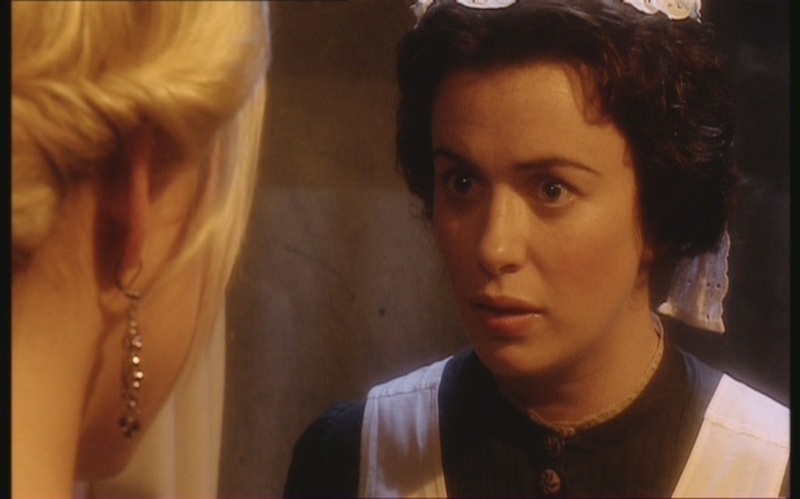 There are a number of scenes like this one from various episodes in the Davies era. There was the one from the previous episode where she talks to the maintenance person and one where Martha Jones is trying to get The Master’s nurse to swear in front of her. For the most part these scenes don’t really drive the action forward very much, but they do serve a great purpose in establishing that no matter where or when you are, people are not really all that different. An alien at the end of time still has the same thoughts and feelings as a doctor in the twenty-first century. These scenes can only be done with the companions because they are a very human aspect of the show that The Doctor just doesn’t fulfill. The Doctor will protect and save humanity, but there is never any doubt that The Doctor is not one of us. He is not human. He never will be. He can like and respect his companions as people without ever really being one of us. When Rose changes into her period garb, The Doctor is shocked and tells her she looks beautiful, for a human. That kind of sums The Doctor up in a nutshell. He can enjoy the companionship of Rose in an aesthetic way without ever really feeling an actual, real connection to her on a human level. I currently have my pug sleeping on my chest. I love her and enjoy feeling her fur with my fingers, but I never for one moment think that we are on the same level. It doesn’t mean that I don’t love and care about her, I just know that we are not the same and we never will be. I find the nature of the conflict between Rose and The Doctor to be fascinating. The aliens asking to use the bodies of the dead is an interesting morality question. Our culture sees the defilement of dead bodies to be an atrocity. 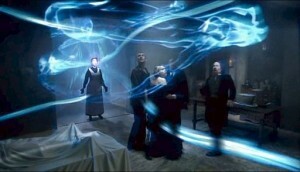 But, if you see it from The Doctor’s perspective, whatever made those people who they were is now gone. We throw away millions of viable organs every year because people need to opt in to organ donation programs and many times the organs are either unusable or the doctors are too worried about being sued to harvest them. If you look at things logically, it should make total sense for us to let these aliens inhabit dead bodies. However, on a basic human level, we see this as abhorrent. It seems like a cop out at the end when we discover that the aliens are actually horrible people and we can feel good about denying them access to the bodies. I also wanted to address Gwyneth’s death. I am a sensitive person. I am hurt very easily by other people’s pain. One struggle I personally have is trying to separate other people’s pain from my own. I keep feeling like I can take their pain from them and that they will feel better, but you can’t do that. Everyone has to experience their own pain. Gwyneth’s willingness to allow herself to be a conduit for these aliens spoke to me because I could totally see myself doing the same thing. I would feel like I was special, or chosen because I could help save these angels and I would allow them to destroy me. I have done that before. There is something intoxicating about feeling like you are the only person who can help someone that sets you up to be in a position of being damaged by forces you don’t control. Extreme empathy can sometimes feel like a gift, but it is a gift that brings destruction if you can’t learn to protect yourself from its consequences. This episode isn’t as bad as I remember it being. I was kind of dreading having to watch this episode after the great one we just had and knowing the great episodes coming up before the end of the season. I guess the thing that kind of makes this episode for me is all the breadcrumbs that would be picked up for Torchwood. I know other people don’t agree with me, but I don’t feel like the past few seasons have had the same world building that these first few seasons have. Introducing Danny Pink to be Clara’s boyfriend and to set him up to be sacrificed at the end of the season is different than having a few recurring characters who show up over several seasons. I had also overlooked the plot point where everything hinges on Gwyneth’s embracing of her destiny to be destroyed by the angels. As much as The Doctor and Rose disagreed about whether it was moral for the aliens to inhabit dead bodies, if Gwyneth had not agreed to be the conduit, the argument would have been moot. This is a pretty solid episode. The writers probably did right by going back in time. These first few episodes lay the ground for everything that comes after it. I think writing a critical assessment of this episode gave me a better understanding of the emotional resonance of the episode. Up next, we have “Aliens of London.” We get to see the fallout of Rose’s decision to jump in the TARDIS and follow The Doctor to the end of the world. This entry was posted in Doctor Who, Pop Culture, Science Fiction. Bookmark the permalink.